The heads of pop geeks are bound to explode over a capsule like "Pete Yorn fronting the Jayhawks," so lay down a tarp. 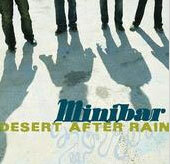 Minibar are American-roots-steeped Brits who migrated to Hollywood, released a dud big-label album, then returned wiser with this far-more-realized indie disc of SoCal harmonies, English pop hooks and alt-country atmospherics. Ka-blooey!